Union began as a live recording of a semi-traditional Jewish wedding ceremony held in Yosemite National Park. Samples were extracted from the wedding ritual as well as from the wealth of nature to be found in Yosemite. The babbling of a brook, the wind in the trees, the voice of the rabbi... a variety of elements were brought together to create the astounding 28 tracks that are Union. Initially small musical fragments were created to accompany the texts and photographs of the Union web installation viewable at http://www.vialuminosa.com/union/. These first fragments were then re-mixed and lengthened and expanded upon to create a more detailed assortment of stand alone musical pieces. Each track blends into the next for a smooth experimental ambient electronic listening experience laced with traces of glitch and tribal. "Kyron puts forth a multi-faceted, fascinating work that weaves its way easily from edge-of-hearing minimalism to beat-possessed electronica. Much of Union hides in plain site, the elements so pared back that they're almost invisible to your ears. Then it will spring out in a heartbeat, drive up your pulse a bit or surround you with a craftily created environment before letting go again. Over and over. This disc probably holds my personal record for the number of times a cut from it came on while my iPod was on song shuffle and I had to know who it was. It happened a lot. As interesting as individual pieces may be (and there are 28 of them here, many quite short) Union comes together in a dedicated, start-to-finish listen as a work with a definite narrative that glides from a whisper to a bold voice. I appreciate Mendizabal's timing--he has a solid feel for how long to keep things on the quieter side before re-anchoring the listener with more concrete sounds. Overall, this is a disc that you really need to set aside time for. It's made to stand up to a focused deep listen. Of course, it also pays off nicely as background augmentation. Union is a Hypnagogue Highly Recommended CD." "Having listened to Union several times, from beginning to end, I know I cannot write a standard review. Normally, I would single out certain tracks and write my opinion of them. With Union, this is impossible because this is not about individual songs but about a sixty-three minute masterpiece of sounds. I love the sounds of Yosemite National Park interweaving with the sounds of those present at the Jewish wedding. All this floats gently in and out from within very soothing and deeply felt music. Union is an almost spiritual collection of sounds that will transport you into a very peaceful and relaxed state. It is truly magical. 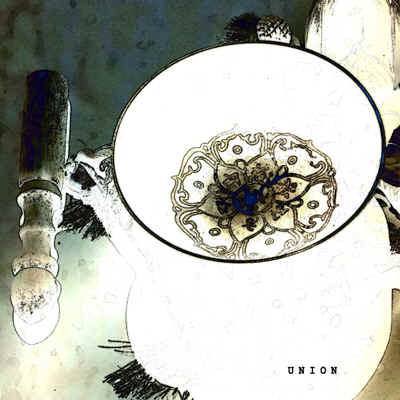 Union is an awe-inspiring and exquisite creation. For me, it is proof that Kyron is a vastly talented man who has passion and love for what he composes. With the marvelous sounds of nature and the profoundly spiritual array of Jewish wedding samples drifting in and out of the music, there can be no faulting of this work of art." "Union Told By A Shaman"
"Kyron is the longest running musical project of California composer Juan Carlos Mendizabal. His most recent release, Union, is a suite of interconnected electronic rituals, little windows opening to rhythmic fragments, culminating in an extended tribal dance beat replete with swampy woodland sounds and distant chanting..."